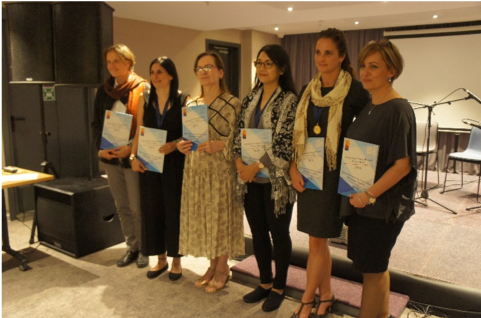 It is a real success story this combination of award ceremony and women’s conference, which Democracy Today Armenia and Gulnara Shahinian with her team organizes in a brilliant way since years. 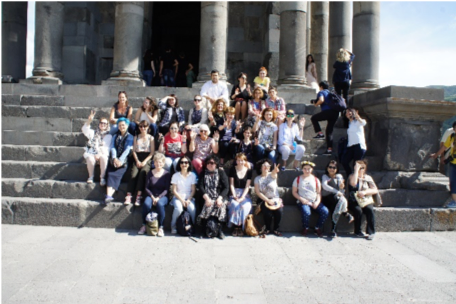 This year women activists and journalists (and few men) from 20 countries participated: from Armenia, Georgia, North Caucasus (Karabach, Ossetia, Inguschetia, Dagestan, Tchechenia), Russia, Ukraine, Cyprus, Iraq, Syria, Poland, France, Italy, Germany, Birma (Rohinga), Columbia, Israel-Palestine. 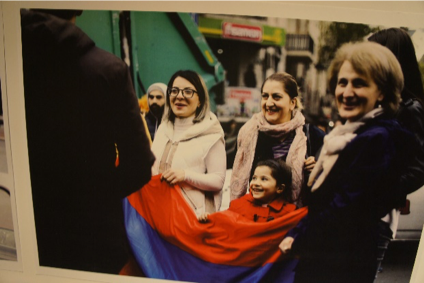 Under the impression of the successful and peaceful “velvet revolution” 2 weeks earlier, Armenian women were especially proud of their visible and peaceful presence in the street, struggling for democratic change. What had happened: heavy political tensions in the first days after president Sargsyan had decided not to quit his office and send police and military to suppress protests (as he always did before). But ordinary people from day to day occupied more public space and marched with the opposition (leader) – first in the capital than the movement grew with impressing peaceful demonstrations also in smaller towns and villages all over the country. (Young) women, trained and empowered locally and nationally since years and connected, could show that they don’t have fear to bring their children to the street and day after day they were more numerous: Creative actions, singing, writing posters, a strong feeling of democracy. And they made the change! 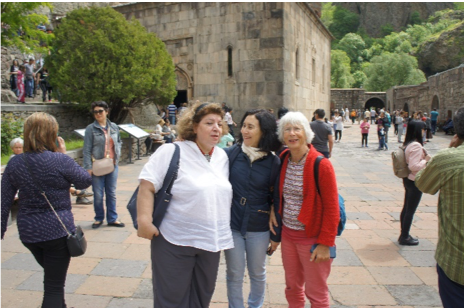 The role of media in conflict prevention and transformationand the role women “peace journalists” can play, was the focal point in the 2018 conference: “It is not time to be silent!” as Janet Bedoya, the Columbian journalist, engaged in the peace process in her country emphasized. Media help shaping what we see and hear about conflicts around the world. But economic interests and increased corporate control to sell stories and programs play the major role in controlling the types of stories that get covered and the way stories are framed and embedded in propaganda and power games: “If it bleeds, it leads.” That means violent conflict will be headline news, not news of cross-cultural dialogue and the people, the women building peace as agents of change (not just being victims). The stories are about how the manage their daily life beyond the frontlines (education, food, survival, energy, love). For generations, women have been at the forefront of peace advocacy and have demonstrated a unique willingness and capacity to bring together conflicting groups in the search for common ground. In the women-led peace efforts of recent years, advocates have been successful in convening diverse actors and creating the conditions for building consensus. By engaging those written off by the society and calling for reconciliation, dialogue, and cultural sensitivity to build social cohesion—not only as an end goal but as an operating principle – the voice of women peace builders has strongly established its importance. What are the methods, roles and strategies, which have to be developed in the eyes of participating media women in the discussion with activists to bring peace related stories to the media’s attention? Develop high professional sensibility for background stories and different narratives: Show best their interest and diversity through all media channels and on all levels of communication, using photography, documentaries, print media, social and alternative media channels, train citizens journalists. Stop clichés, resist to stereotyping and always reflect where the camera and the reporter should stay and with whom build confidence. Get trained to remain open minded and dismantle hate speeches,“ even in a war situation, don’t put hate in your heart”- said a young Georgian peace journalist. Never follow the mainstream of sensational propaganda, quick superficial stories in the name of power interests and/or donor requests. Oppose shrinking space for international news through the maintenance of active networks and collaboration in international frameworks – together with activists and professionals (media and politicians). Request everywhere equal representation/participation of women and men on all levels of decision making, representation and professional expertise. Try to find a just mix between protection and confidence for yourselves and the “clients”. Keep a constructive spirit for dialogue and social cohesion even if relations develop in difficult directions. Keep public awareness alive and hold connections, especially if a conflict has lost the coverage of the big media, because it is “frozen”(Caucasus), a peace treaty signed (Columbia), seems to be solved because of propaganda by political power (Grosny-Chechnya), if a conflict seems “everlasting” without solution and too complex (Israel-Palestine, Syria). What are the methods, roles and strategies of the international (women’s) community of peace activists? Strengthen solidarity and meetings with all conflict-affected people (with a strong focus on women and patriarchal militarized structures). Promote great sensibility regarding conflicts in all phases and traumata. Keep an eye on conflict prevention, international mediation, post conflict rehabilitation and justice. Support the fight against impunity for perpetrators and war lords through media and juridical coverage. Denounce fake news and their destructive psychological and physical consequences for peace and confidence building. Keep and strengthen the links to women and their stories in conflict affected areas and try to bring their cases and needs to supranational institutions (e.g. “reclaiming the UN as a Peace organization”/WILPF, strengthening Human Rights approaches and the protection of HR defenders in the OSCE context/Civic solidarity platform – working group on women and gender realities). Implement fully UNSCR 1325, with adequate NAPs (re-loading 1325!) and all follow up resolutions of the Women Peace and Security/WPS agenda with a major focus on young women (UNSCR 2250) as important agents of change. Stop the war machinery, stop arms production and trade (using CEDAW, UPR, ATT, Bejing platform of action, invest in signing nuclear ban treaty), move the money from war to Peace (education, culture, needs and life in dignity), invest in feminist economic structures. The conference ended in a refreshing outdoor discussion in a wonderful countryside, embedded by great regional food, with inspiring talks on breaking stereotypes, on how women can best negotiate and sustain peace incollaboration between frontline journalists and women peace builders to promote work by women. The understanding was deep and the women felt united by a great hope to keep the network going and to meet again.